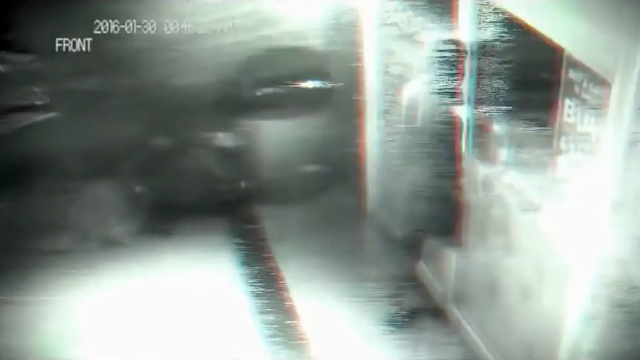 UFO SIGHTINGS DAILY: CCTV Seems To Capture Ghost Or Time Traveler Passing Through Door Of Closed, April 2016, Video, UFO Sighting News. CCTV Seems To Capture Ghost Or Time Traveler Passing Through Door Of Closed, April 2016, Video, UFO Sighting News. This is an interesting video. A person walks through a closed door into a shop. The shop lights flicker on for a few seconds, then off again. He/she soon walks out eating something like a sandwich. Also the date and time flickers on the video. It changes from 2016 to 2019. Very strange like the person had a time energy vortex around them that effected the date on the video. Man Caught In CCTV Going Through Wall. See It For Yourself. Surveillance camera records a light inside the store and then immediately a hood man through the door like a ghost, or as many say can be a time traveler, or someone going through another dimension. ​Also have noticed that the date above the video the moment he walks through the door of a jump for the year 2019 would be a quantum leap for the future? Soon after still inside the store date is jumping from 2016 to 2019, and to go back it stabilizes in 2016.